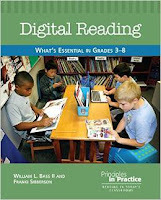 It was exciting to read these first two chapters of Digital Reading: What's Essential in Grades 3-8 by Franki Sibberson and William L Bass II. Click here to read more about #cyberPD or click here to join the Google+ discussion group! It's a pleasure every summer to participate in this knowledgeable group. I've taught gifted middle school students in a mixed 6, 7, 8 core classroom in an independent school. I moved from the classroom 5 years ago to be the school's literacy coach, then this year took over a class again. Now I've retired, but still am so interested in what everyone might share about how they are doing with integrating digital reading in their classrooms. These first two chapters were good introductions to the authors' premise, that important things always happen in a great reading workshop, but things they are a changin', and it's time to include, and USE, the digital world now available to us. Perhaps especially we need to consider that it's most readily available to our students! The Introduction: The further examination of what close reading means, and the "Implications for Instructional Policy". p. 11, x I would add that because these implications include so many new things for integration into the workshop, teachers need added PD within the staff, across age levels, in order to share what they're doing and why, what resources are helpful (like this text). Additionally, on p. 12, xi, there are the suggestions for "Policies on Formative Assessment". Like we as teachers have become readers and have realized how important it is to be readers, now we also need to examine how we are using, and learning from, digital and complex texts. To use an old cliche, "it's a whole new ballgame". After a bit of searching, I found one article from Educational Leadership that looks interesting: "Re-thinking reading assessment in a digital age: How Is Reading Comprehension different and where do we turn now?" You can find it here. I also liked that Franki and Bill shared the "opportunities to deepen understanding of topics. . ." to help prepare teachers. p. 13, xii. Chapter One: I enjoyed the student examples of Marissa's and Julia's differences in reading practices when examined closely. And Sara's story of her disconnect because of the inability to use her devices in school. The NCTE definition of 21st Century Literacies. p. 22, 7, then further on, ways skills expand and change because of digital tools. No longer can we tell a student to "use this book to take notes from which to form the 'next questions' in order to delve into even more books to deepen understanding." Monitoring for understanding also means choosing sources and being rather savvy with where you might go to find appropriate sources. I think I could back up and back up with the scaffolds needed in order to support a student's work online. And I have, but it feels as if it's becoming more complex than it used to be even a few years ago. Franki and Bill write: "Learning to read digital texts must be embedded in the ways we do our literacy work on a day-to-day basis." p. 26, 11 This takes time and understanding, plus commitment to change. I'm so glad that this book is going to help! I love the organization into three anchors: authenticity, intentionality and connectedness. It will help the focus of our learning. What about the teachers/classrooms/students/buildings who lack technology adequate for learning? I believe it's a problem still, and wonder how the challenge will be faced? When will the additional PD happen for teachers? Will it happen? Will teachers express their needs for it? Thanks Cathy, Laura and Michelle for hosting. It's a start of a terrific book! We agree with so many of the points you made. We also loved how they focused on 3 very important words - authenticity, intentionality and connectedness. Thanks for responding. Those three things will be so interesting to consider as we read through the chapters. So thankful to have you apart of the #cyberPD group again! You bring up some valid points in highlighting the text. You said it best: "It's time to include and USE the digital world now available to us." But it's ever changing, so we need to give our students the skills to be critical users of digital texts and tools. Sara's story made me so sad! But how many of our students feel this way? That if they want to learn something, they'll just do it at home! That's not our goal in education, so we need to change our ways to meet the needs and demands of our students. Of course, there are foundational skills that we can embed and teach through shared authentic experiences. I think that is key: learning together! The three anchors are going to help solidify our learning. I continually come back to authenticity which directly relates to intentionally planning which then relates to being connected! I think you ask two very important questions at the end ... and after reading several responses already, the lack of technology in classrooms is a challenge. Then the additional layer of PD for teachers? I know in my district as we started this last year with 1:1, the district encouraged us to play and then PD came later in the year because we had a better idea of what PD we wanted and then it was provided with choices and options. It was the perfect opportunity for learning! I'm more concerned about the literacy than the tech piece though! And thank you for your response, too, Michelle. Now being retired makes me want to return, to see what more I can do with students. Our school luckily does have plenty of technology available & so do the students. The additional part is that teachers aren't always keeping up with the new connections that students could have in the world. Just this year I discovered a number of people willing to connect to our students & that was terrific. Remember, each of our students studies individual topics, so connecting and learning from the outside world is key. They are taken on trips to interview experts in the topics and/or viewing museums & other places that broaden the content, but less is done with direct connection. There is so much that just takes time, always a needed commodity. You're so correct in that authenticity too is key to students' motivation and also inspiration, right? I'm looking forward to more from everyone! I love your post! I really appreciate the link to the article about how reading comprehension has changed. I took a quick look at it and will dive deeper into it later. I also appreciate your question at the end. How do we get all teachers on board with the importance of teaching digital reading and integrating technology into the classroom? The students teach me so much each day in regards to technology and we learn together as a classroom. It seems that each staff group must decide themselves about digital reading conversations, how they'd like to learn and proceed through the year, Megan. Like our classes, each staff is in a different place with technology, so it's a challenge to make PD fit every one the same. Yep, I learned a lot from my students this year, & there was often someone who could answer a question when I needed one answered. Thanks for your input! Thank you for the link to the Educational Leadership article, Linda. Such a great piece. You might find this interesting too! It is from The Reading Teacher. And thank you for this article although I don't think I have access to it. I've only subscribed to the Adolescent Lit journal. I'm glad you enjoyed the Ed Leadership article. I am so impressed that as a retired educator you are digging into this book and the book club. I loved the focus on the three pillars as well and the organization of the book is really going to help us as we go through it. It is interesting that you noted the differences in the e-version and print version in page numbers. I am also reading the eversion and I am sure that some of the formatting of the charts is different. It is interesting that I generally prefer to read on my Kindle, but for professional books prefer a print copy. I only went with the eversion this time because I needed to be able to travel with it. This ebook was fast, but with the PD books, like you, I prefer the print version so I can mark them up. Unfortunately this ebook comes as a pdf & I am reading it on my kindle, so can't even annotate. I'm sitting & taking notes as I read. I've really enjoyed the beginnings, like you. I connected with the stories of Marissa, Julia and Sara, too! Thanks, Mary Lee. Specific examples, like mentor texts, are always helpful. When I was at nerdcamp so many schools were talking about being BYOD. An interesting concept. I struggle with the authentic part. It's an area I'm striving towards! It does seem complex, Michele, and to add on more is challenging for many. Like anything, I guess a step at a time is the best way. You address some important challenges that need to be considered as we move toward digital literacy. As I've moved from blog to blog, I've noticed there is a significant difference in the technology available to students from school to school. You also mention the importance of professional development for teachers and time for them to talk together as they journey down this road. These are considerations that are imperative --- and often forgotten. There are so many new possibilities as a result of new digital tools/texts. It's amazing how much change I witness from one year to the next. Well, you know I agree, Cathy. And for those who don't keep aware of some, at least, they become farther and farther behind. I hope that staff ask for more time to talk and learn, and/or those in charge of schools realize the need. I'm looking forward to reading and discussing more!